Harvard University Press, 9780674027947, 394pp. 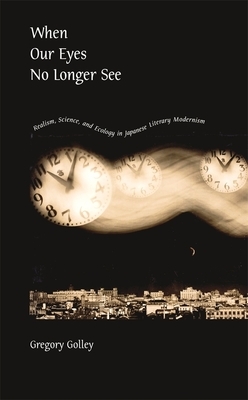 As industrial and scientific developments in early-twentieth-century Japan transformed the meaning of "objective observation," modern writers and poets struggled to capture what they had come to see as an evolving network of invisible relations joining people to the larger material universe. For these artists, literary modernism was a crisis of perception before it was a crisis of representation. When Our Eyes No Longer See portrays an extraordinary moment in the history of this perceptual crisis and in Japanese literature during the 1920s and 1930s. The displacement in science of "positivist" notions of observation by a "realist" model of knowledge provided endless inspiration for Japanese writers. Gregory Golley turns a critical eye to the ideological and ecological incarnations of scientific realism in several modernist works: the photographic obsessions of Tanizaki Jun'ichiro's Naomi, the disjunctive portraits of the imperial economy in Yokomitsu Riichi's Shanghai, the tender depictions of astrophysical phenomena and human-wildlife relations in the children's stories of Miyazawa Kenji. Attending closely to the political and ethical consequences of this realist turn, this study focuses on the common struggle of science and art to reclaim the invisible as an object of representation and belief.